There is a lot to read about sustainability these days, is it possible it is a local phenomena? It has to be. Given that the idea of sustainability is to save time, money and materials by using what is available locally – you have to find out what is around. The LEED Initiative made popular by US Green Building Council (changing the way we think about building, they say) considers that any plant material grown within 500 miles of where you are building is locally sourced. I have to disagree with that 500 miles from where I am a greenhouse would be required to grow what grows outside here. I have learned a great number of new plants that I had never seen when I lived 500 miles north. Florida may be different; but everywhere is different. Sunset Books made a great attempt to zonify America and came up with 36 named zones with added special zones for extreme climates?! The USDA seems to have 15 Zones. Who is right? Probably nobody. So, I thought about what I can get here that is totally local and sustainable. Well, lots of things and these materials make my garden unique to my locale. 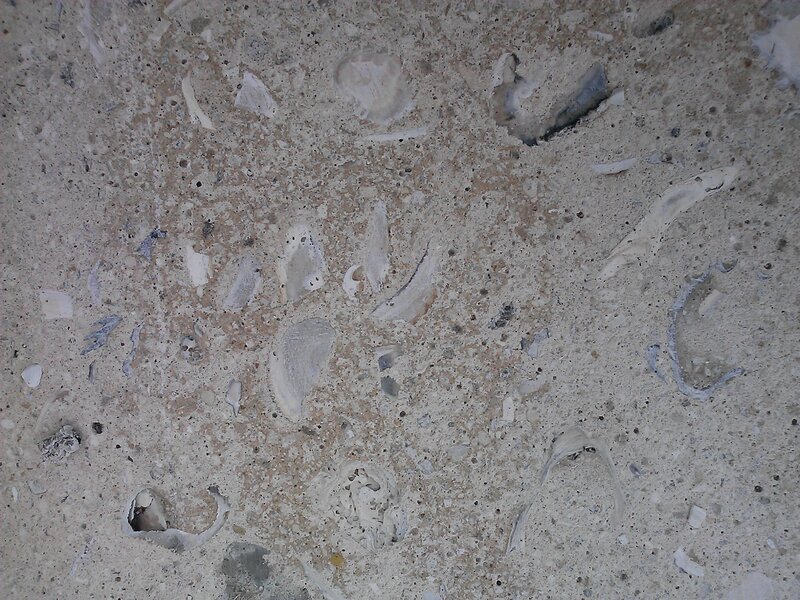 I can get great paving material from within 20 miles of my house, this is 3/8″ graded shell. Larger shell called white washed shell is available for more decorative uses. Shell for driveways, walkways, etc. Possibly a peculiarity of the area I live in; there are plant sales like garage sales almost every weekend. I rarely pay more than $5.00 for anything and talk about locally sourced. 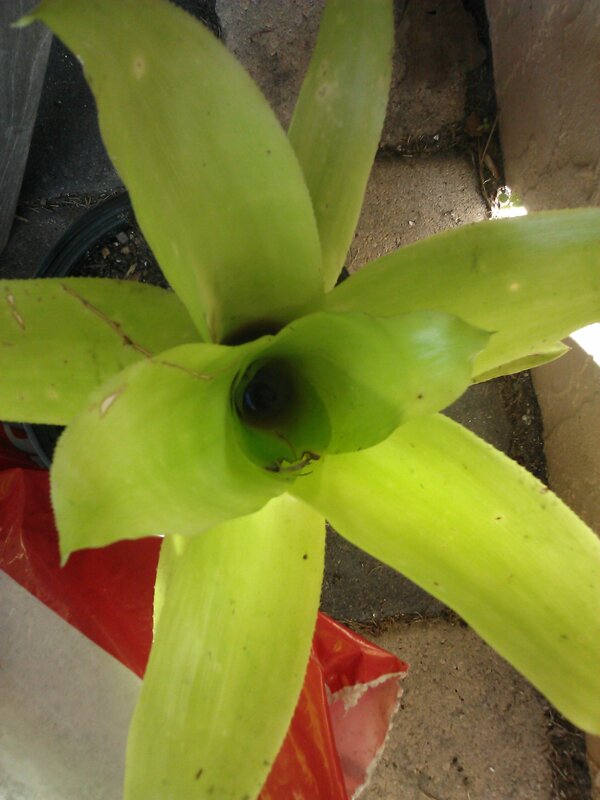 The downside to this is very few people know exactly what it is they are selling – its a Green Bromeliad. On the other hand, it is always a surprise when one of these treasures bloom. One of the joys of gardening. Here is my latest purchase, a nice Chartruesy Green Bromeliad that supposedly takes full sun. That is the full extent of my knowledge, I can’t wait to see what it does. Gardening teaches patience. 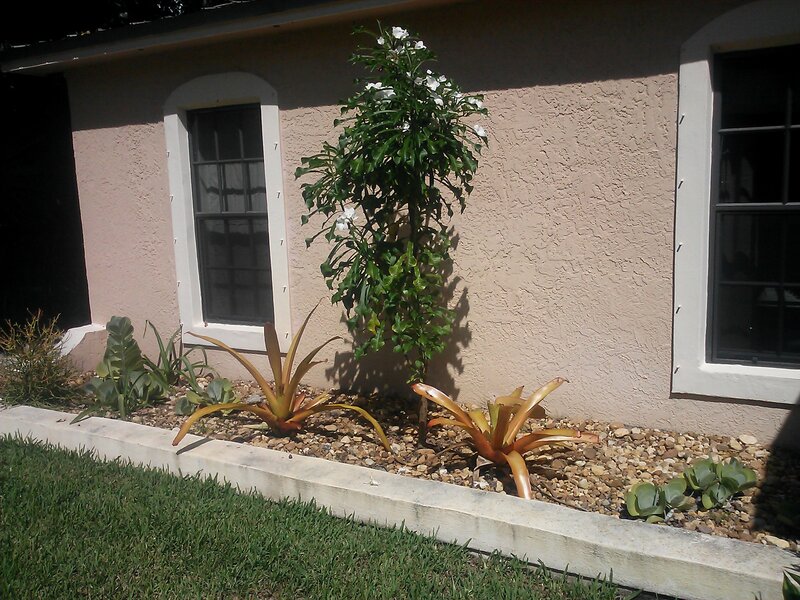 We have a local environmental blogger here on the Treasure Coast who posted about Rain Gardens and inspired this. I have been designing Rain Gardens for about 10 years. It is a great idea for the environment, but aesthetically it is difficult to cope with the fact that unless carefully planned it looks like a big drainage ditch in your front yard. Not a good look. I decided to put some Rain Gardens around our house after discovering that the areas right around the house were not irrigated and the house had no gutters so the rain collected on the ground around the house and was not really concentrated by gutters into 4 or 5 spots. The lack of gutters on the roof is relatively common here, this is new to me. I am not quite sure why – maybe Hurricanes blow them off. 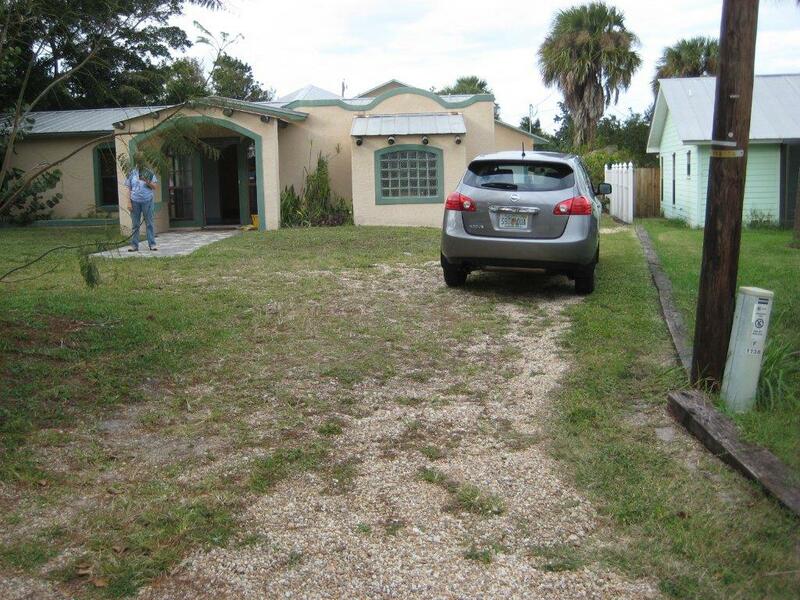 Anyway, we bought the house without gutters and I always, always hated dealing with getting the gutters cleaned, etc. on our house in Atlanta. I was happy not to have gutters. Then it rained, like seven inches. Wow, there were pits in the areas under the valleys of the roof where the water came off the roof. Luckily the yard was so gruesome there was no question about redoing the driveway and landscaping. And we live on a Sugar Sand Dune, highly pervious no water stands anywhere. A big ditch was not really necessary. My father taught Geology at Emory University. He passed on and I inherited his love of rocks, but in a more decorative way. I love stone, boulders and natural materials incorporated into the garden. 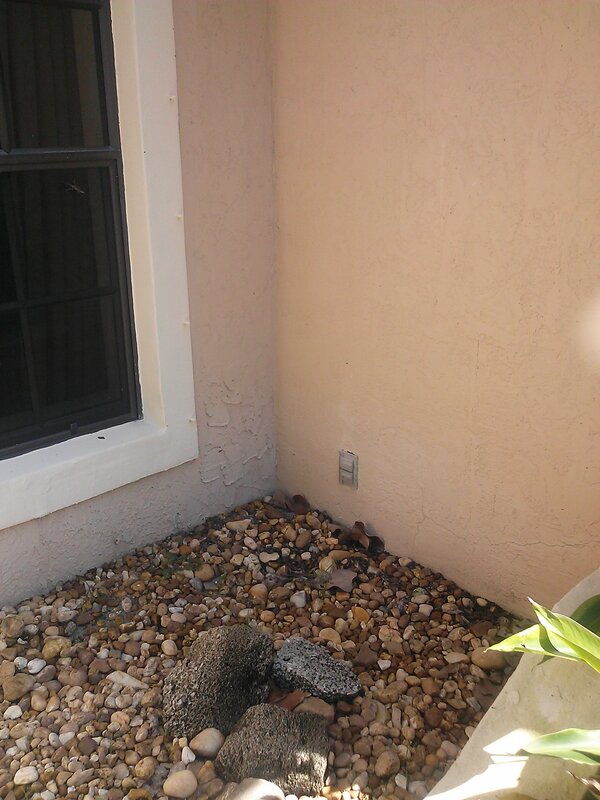 I brought his rocks to Florida and planned to use them in my gardens. 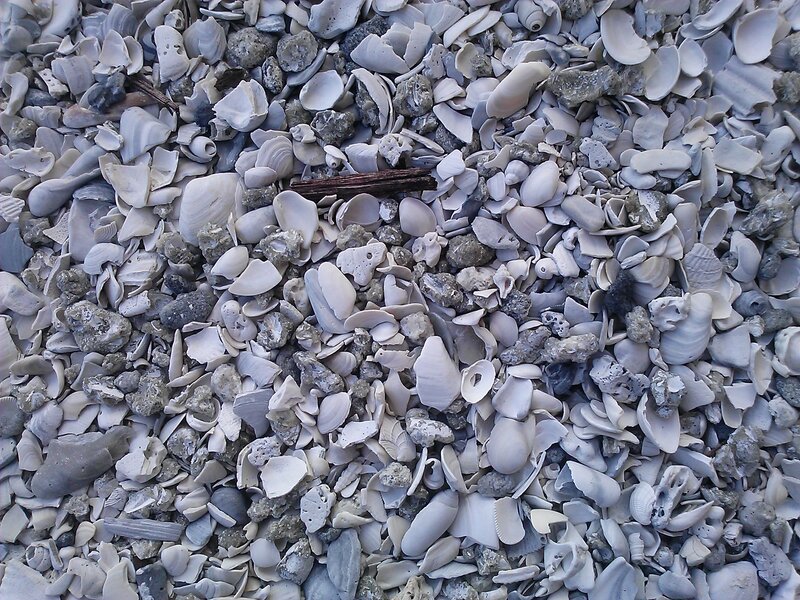 In Florida, I have added seashells and cap rocks in an effort to be more sustainable by using locally available material. The valley of the roof drains onto these rocks, the rocks break the speed of water and then it splashes on down the Egg Rock, waters my plants and drains back into the sand. 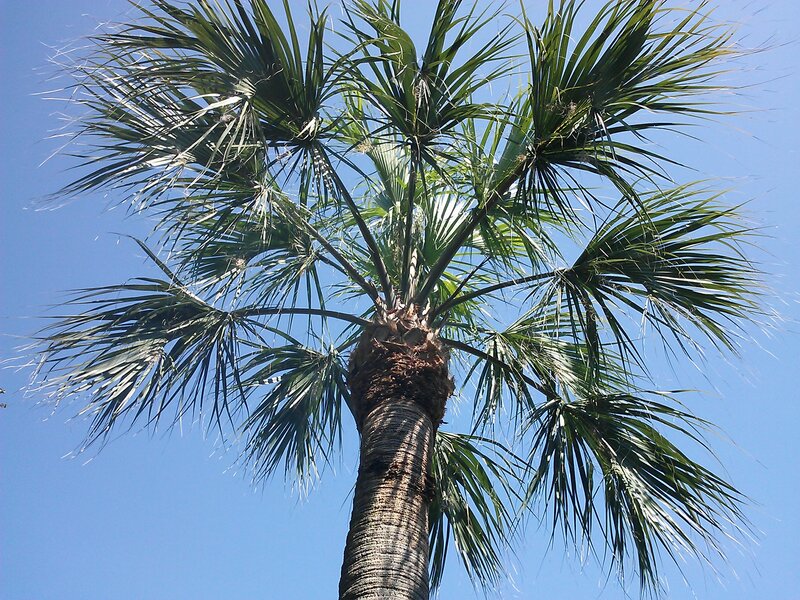 This planter is not irrigated, a bit of a sin in South Florida – it is maintained for the most part by rain. I occasionally water the Plumeria in winter. The plants are placed out from under the edge of the roof so they get watered and not beaten by a big rainstorm. This is the whole garden. A Bridal Veil Plumeria is centered on the house flanked by Lemon Blanchiata Bromeliads then FlapJack plants. A Pencil Cactus anchors the corner. 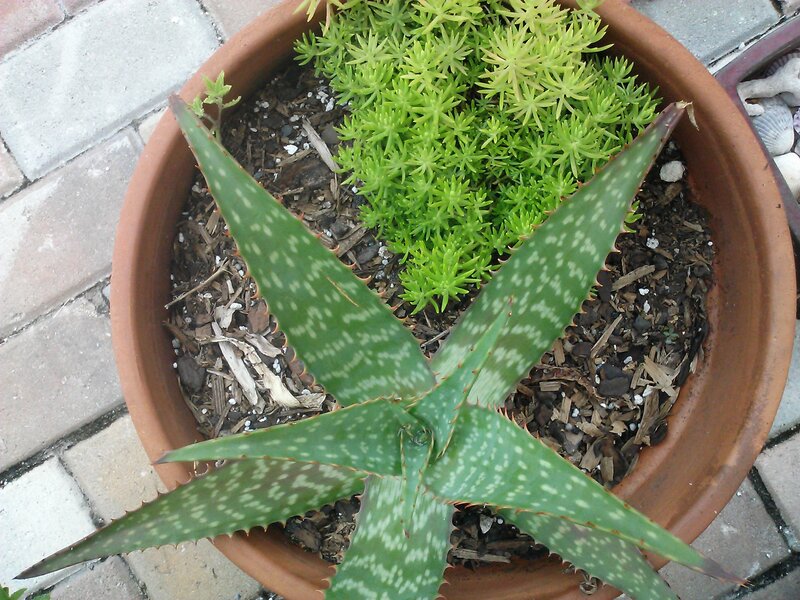 The plant selection is mostly succulents or low water tolerant plants. I had to have the Plumeria for aesthetic reasons and suffer through the watering. This is my other Rain Garden. Again the water comes off the corner valley and lands on the large sized Egg Rock and flows over the Black Mexican Pebbles and drains to the driveway. 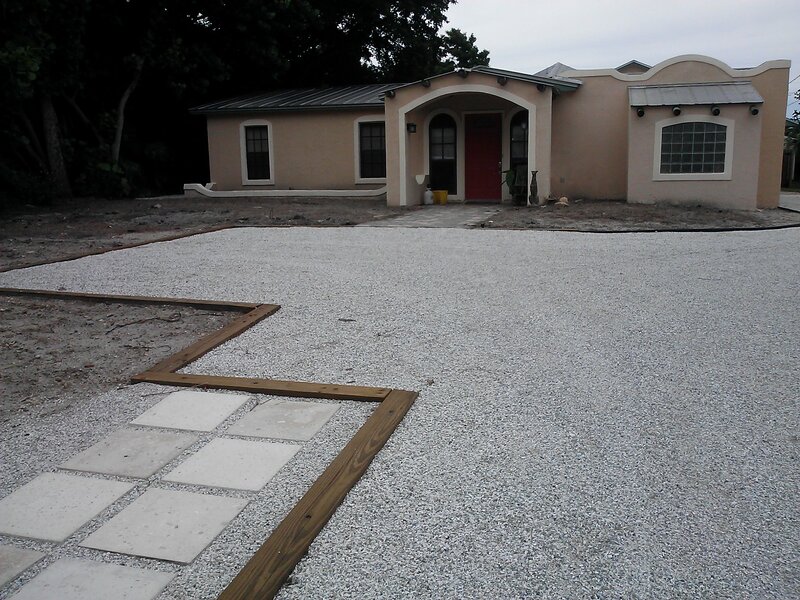 The driveway is made from pervious shell and drains onto a turf area with a french drain beneath it. The Rocks are from my father’s collection and one piece of coral rock from Jensen Beach. Plants are newly planted -a Tibouchina and a Leafless Bird of Paradise. I am watering these plants to establish them. Is there a new style of gardening emerging in America? Based on what we have learned over the past forty years, our style and outlook on gardening are changing. During the 1970’s, Oehme van Sweden, Landscape Architects in Washington, D.C. pioneered ‘The New American Garden’. Their gardens featured perennial grasses in large sweeps and largely ignored lawns. These guys were the original purveyors of the Miscanthus craze that continues to this day. I had Miscanthus strictus in my yard for about three years, as a striking accent plant it worked until it got big and flopped over; this grass once flopped was 10 feet around and not very striking. Unlike my southern mother, I am not a plant staker. Plants have to stand on their own in my garden or they asked to leave. Unceremoniously. The term Xeriscaping was coined in the early 1980’s by a guy in Colorado. Since then the idea has caught on and is utilized in the United States and around the world. Permaculture is an Australian idea that expands and encourages permanent culture of the earth in the most sustainable ways. 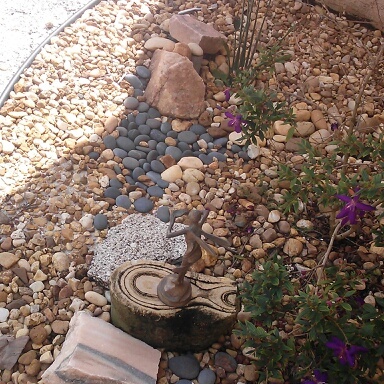 Basically the idea of Xeriscape is grouping plants by their watering and maintenance needs and only watering when necessary instead of just dousing everything. In permaculture the further away from the house you get, the less intensive the maintenance of the landscape. Intensively planted vegetable gardens near the house that fade away into the forest zone by zone. Of course, this is an oversimplification of both concepts. While I appreciate the validity of both schools of thought, the difficulty begins with the fact that all this has to be figured out, zoned, designed and then implemented. I have yet to meet anyone who paid me to do a Master Landscape Plan for their house that did not change their mind about something. Usually a significant something. Rare is the person who can make a plan, zone everything for water and maintenance and stick with the program. I certainly can’t. The older I get , the more I enjoy hardscape. People seem to enjoy taking small bites of sustainability. A Rain Garden in a low spot in the yard. Using pervious gravel or mulch for pathways. Planting native plant material. Cutting out toxic pesticides and herbicides. I have read of eco lawns becoming popular in the Western United States. This intrigued me until I saw what it was. More of the Wildflower Meadow romanticism that has been floating around for 30 years. I think Old fields look great weeds and all. However, I don’t want one in front of my house. I suspect the majority of gardeners like to have some lawn. I have a lawn, purposely sited over the septic tank. It does so well, we are afraid to fertilize it. It might overrun the house late at night. Plant reliable, drought tolerant, non invasive perennials. In small doses. Focus on natives with a soft lens. Some are great. Some are weeds. Do some research; plant the good ones. Quit using Glyphosphate and anything with Atrazine in it. It is already in our groundwater and nobody knows how long it takes for the earth to metabolize it. Stop adding it. Non toxic weed killers and pesticides work. If you have a few bugs or weeds – get over it. Support your local gardening community by planting seasonal containers, they are different everywhere. A pop of color near your favorite walkway is a pick me up every time you pass by. I like succulents for the summer. My size limit is a 15″ wide container, if it is smaller, it takes too much maintenance, (watering). Buy a big pot, go to the local nursery, buy some flowers and hope for good advice. Embrace local..add some tropicals in the summer. Floridian growers need support too. Use the most drought tolerant turfgrass possible. If it turns brown in winter, so be it. If there are a few weeds in it, so be it. The Golden Bear does not live at my house, I think he is retired.. I think people get overexcited about irrigation. I have never had separate zones because I am really frugal with water. The lawn has to need it badly before the water comes on, if I have a new tree it gets a gator bag (this is a bag that can be filled with water, the water slowly leaks out onto the tree providing a few days worth of water). Irrigation does not abdicate anyone of the responsibility of paying attention. It will not establish anything but turf unless everything is wastefully watered. I think the New Modern American Gardening Style is Rustic. The Rustic Style includes: Being mindful of water and its use, ceasing the use of toxic chemicals, a little brown and a few weeds are OK. Always have a nice container planting where it will be enjoyed. Add hardscape where you would like to hang out and relax, it is really less maintenance. I think it was the Landscape Architect Dan Franklin, who said: “You should be able to take care of your garden in the time it takes to drink a cup of coffee in the morning or a glass of wine in the evening” I am striving for that.